From the moment you walk down the aisle to the reception afterward, let us assist you in creating the wedding of your dreams. 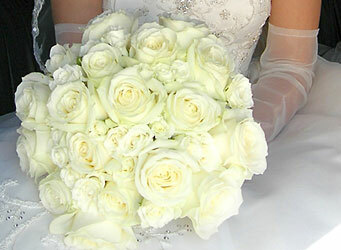 The bridal bouquet, while perhaps one of the most important bouquets, is just the beginning! Coordinating bouquets for bridesmaids, boutonnieres for the groom, groomsmen, and ushers, corsages for the ladies in the family... Decor for the ceremony including arrangements for use in the church or even outdoors... And of course the decor for the reception, such as bouquets for the tables, accents for chairs and even to enhance the wedding cake! Simple bouquets to stunning floral masterpieces add a touch of style to any special event. From corporate banquets to personal parties, on any scale, with any budget, we're ready to help! Just let us know the details and we'll make it a special date that is sure to be remembered.